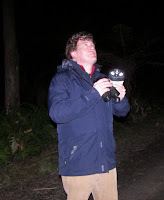 The following report covers a birding trip I did to South Australia in 2002. 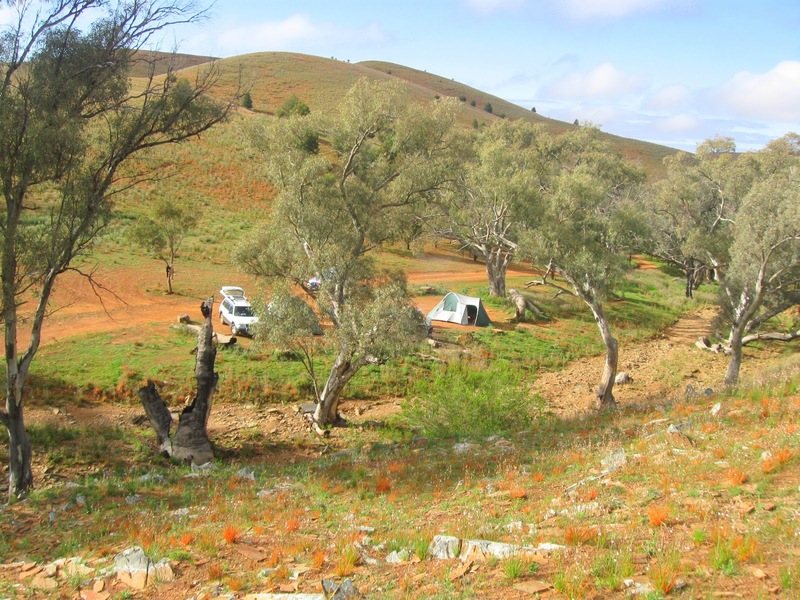 This report includes information on Gluepot Reserve, the Flinders Ranges and the western section of the Strzelecki Track. 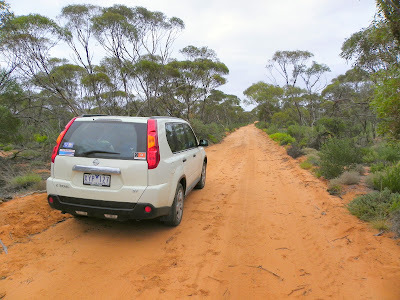 I returned to Victoria via Broken Hill and Kinchega National Park in western NSW. 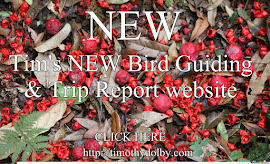 (Note for more information, see my more recent trip reports on the Flinders Ranges and Gluepot). In terms of the birds, the trip was brilliant. 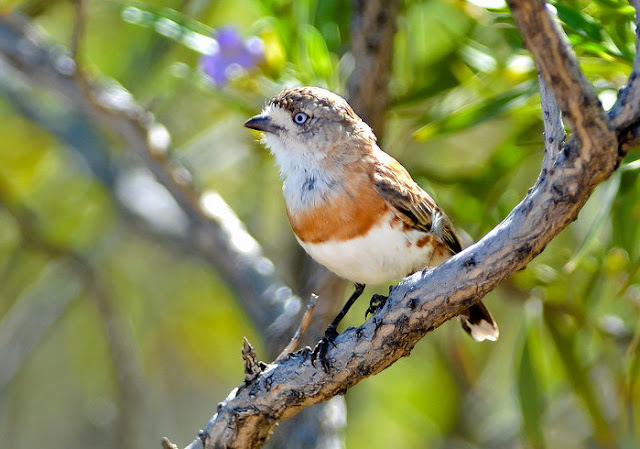 The highlights and my main target species were Chestnut-breasted Whiteface, and three Grasswren - Thick-billed, Short-tailed and Striated. Indeed, I'd personally dubbed the trip the 3GW and CBW Trek. Other highlights for the trip included - in no particular order - Black-eared Miner, Letter-winged Kite, Inland Dotterel, Chirruping Wedgebill, Rufous Fieldwren, White-backed Swallow, Orange Chat, Redthroat, White-browed Treecreeper, Red-backed Kingfisher, Common Sandpiper, Chestnut-browed Babbler, Little Crow, Crested Bellbird, Spotted Harrier, honeyeaters such as Grey-fronted, Striped, White-fronted and Tawny-crowned, fairy-wren included White-winged, Splendid, Variegated and Superb and there was a very nice selection of inland parrots - Elegant, Mulga, Regent and Blue-winged Parrot, Blue Bonnet, Mallee Ringneck, Crimson Rosella ('Yellow' ssp flaveolus) and Major Mitchell Cockatoo. My first stop for the trip was the Grampians in western Victoria where, around my campsite, were White-browed Babbler, Rainbow Bee-eater, Jacky Winter and Spiny-cheeked Honeyeater. Interestingly all of these birds followed me throughout my travels through northern Victoria, South Australia and western NSW. From the Grampians I headed north, staying a night in the Renmark Hotel (not a pleasant experience), and then drove into Gluepot Reserve. At Gluepot I camped at the excellent Babblers campsite. 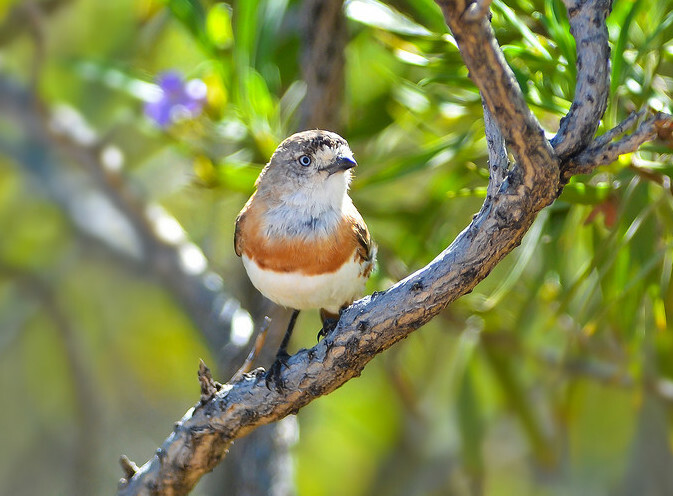 The birding around the campsite is simply superb, with species such as Striped Honeyeater, Crested Bellbird, Australian Owlet-Nightjar, White-browed Treecreeper, White-browed Babbler, Mulga Parrot, Hooded Robin, Red-capped Robin, Gilbert's Whistler, and there was a family of Orange Chat at a nearby dam. A good place to see Black-eared Miner is at the intersection of Track 8 and the Birdseye Block Restricted Area; there's a resident flock of at least twenty birds here. It is also a good spot to start looking for Striated Grasswren. I saw a number of Grasswren along the boundary track, in the second area of Spinifex grass, about 2 kilometers down. They were calling loudly, and at one stage I was standing between a male and female who were bouncing calls off each other. Fantastic. From Gluepot I headed to the Flinders Ranges. Between Peterborough and Orroroo I several Black Falcon and between Orroroo and Hawker there was a Letter-winged Kite roosting in tree. Spotted Harrier was quite common throughout the area, and there was also Inland Dotterel skulking in the gravel roadside between Orroroo and Hawker. I was literally able to park the car next to the bird. 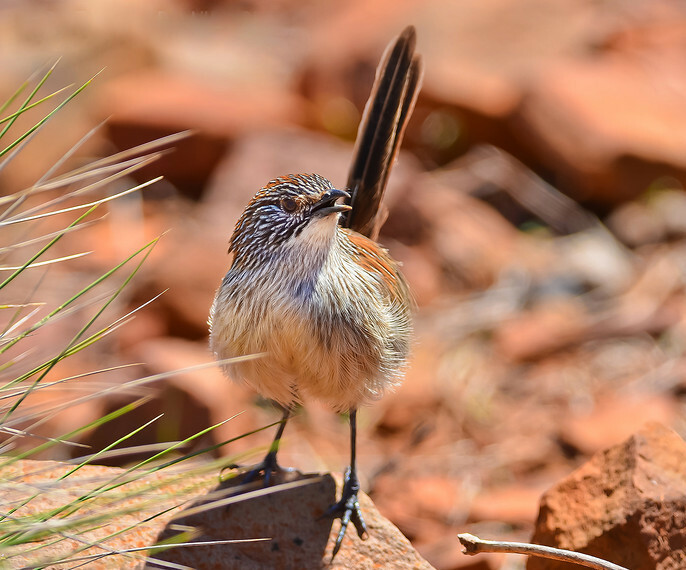 Short-tailed Grasswren - Stokes Hill, Flinders Ranges. It is worth staying at Willows Spring at the base of Stokes Hill in the Flinders Ranges. There are excellent creek side campsites (it cost me $10 a night as a single a few years ago), and I had a large camping area to myself. It's also next to Stokes Hill, the Short-tailed Grasswren site. A range of birds flew up and down the creek, including lots of Mallee Ringneck, Mulga Parrot, Red-rumped Parrot, Spiny-cheeked Honeyeater, Brown-headed Honeyeater and Yellow throated Miner. There was also a resident pair of Nankeen Kestrel who sat over my camp fire and hawked for insects. A Willow Springs camp site. Superb. 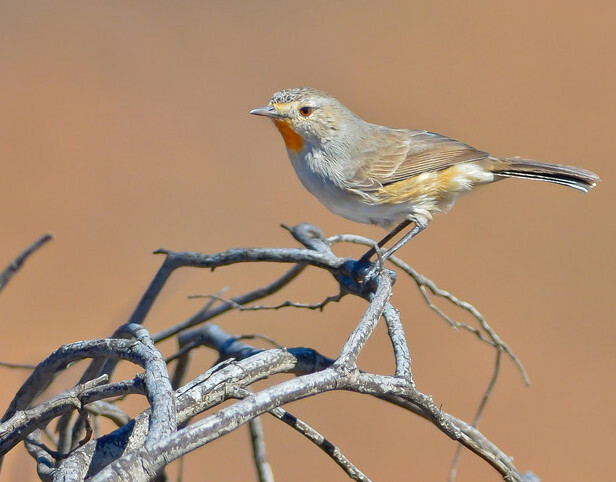 The best place to look for Short-tailed Grasswren (locally known as 'Flinders Ranges Grasswren') is the Stokes Hill Lookout. I found them after about 40 minutes of searching. Direction: from the car park, follow the fence line to the next hilltop. Look for them around rocky areas, particularly those linked with grass trees, for example about 50 meters west of the fence line. There is also a little gully in this area, which was also excellent. I saw at least six birds, some very closely. At Wilpena Pound it is worth doing the walk to the lookout. Along here you usually can see Tawny-crowned Honeyeater and Grey-fronted Honeyeater (easily distinguished from the more common Yellow-plumed Honeyeater). Another good spot for birds was Parachilna Gorge. A walk along here produced Redthroat, Chirruping Wedgebill, Elegant Parrot, Zebra Finch, a pair of Peregrine Falcon high in the sky, Black-fronted Dotterel, Grey Teal, Variegated Fairy-Wren, White-browed Babbler, Southern Whiteface, Sacred Kingfisher, Dusky Woodswallow, Rainbowbird, Spiny-cheeked and Singing Honeyeater, as well as a small group of wild goats and wild sheep. Other spots of interest in the Flinders Ranges are Wilkawillina Gorge (where you can see Yellow-footed Rock-wallaby), Bunyeroo Gorge, and Brachina Gorge, all which require 4WD river crossings, and the picturesque town Blinman. Chirruping Wedgebill and Zebra finch are common on the road between Brachina Gorge and Parachilna. 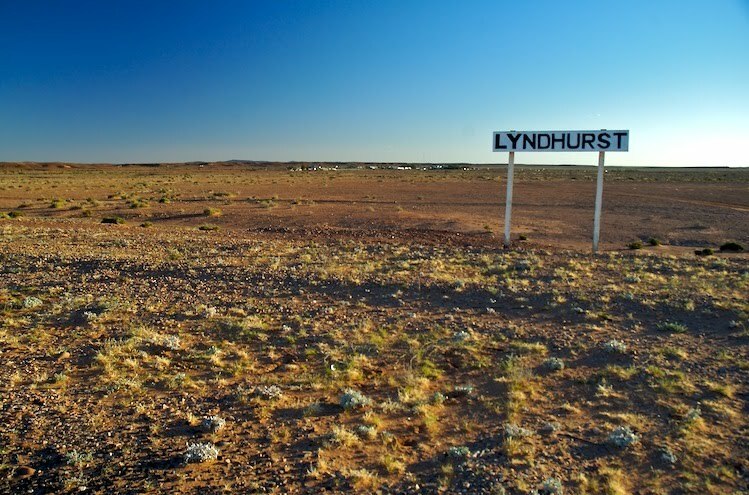 From Parachilna I headed to a known site for Chestnut-breasted Whiteface, located on the Strzelecki Track 27.2 km east of the township of Lyndhurst. Here there a small track that leads north - a small rock cairn marks the turn-off (-30.205201,138.606142). Follow the track until you get to a creek bed, where there are signs of a campsites either side of the creek. Chestnut-breasted Whiteface. Western Strzelecki Track. Here's some directions to where I saw Chestnut-breasted Whiteface. From the campsite I head west towards an old mine site (-30.198507,138.600939). In front of the mine there was a small track that leads west. Follow this. After crossing a small rise you will see two small hills in front of you that look like two camels humps. There is small creek here that branches north (to the right) below the camel humps (-30.1158,138.3617). Follow the creek for 100 m until you come across a pleasant section in the valley (-30.1158,138.361). Here there was a small party of Chestnut-breasted Whiteface, flittering delightfully around the west side of this small valley. This area was easily the most productive area in terms of birdlife. It just looks right. 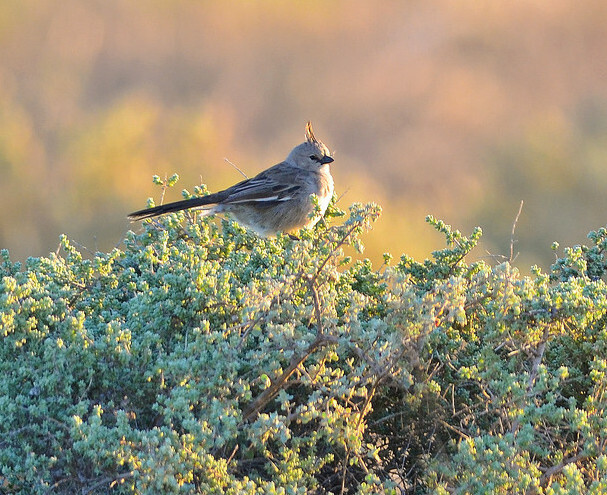 A small family of Thick-billed Grasswren was seen in the open plain adjacent to the Strzelecki Track (immediately to your left when you turn off the Strzelecki Track) near half-meter high rocky platform, about the size of a tennis court (-30.203022,138.603964). This is the area across the creek from the campsite i.e. between the campsite and the old car. Other birds seen while walking around the superb site included Redthroat, Rufous Fieldwren, Cinnamon Quail-thrush, Chirruping Wedgebill, White-winged Fairy-wren (common and, in the sun light, looked extremely blue and white), Singing and Spiny-cheeked Honeyeater, Hooded Robin, Black-faced Woodswallow, White-backed Swallow (which sat beautifully on the wind), Little Crow, Zebra Finch, Australasian Pipit and I flushed a Spotted Nightjar. Although I didn't see any, Gibberbird have also been recorded here. Kinchega is an interesting park. Lying on the banks for Darling River, when I was there it was all but dry! In park there were also several large lakes: Cawdilla Lake and Menindee Lake. Some of the interesting birds seen including Chestnut-crowned Babbler, Blue Bonnet, Variegated and White-winged Fairy-wren (common), Orange Chat, Crimson (Yellow) Rosella, Little Friarbird and Common Sandpiper. From Kinchega, down to Mildura (Red-backed Kingfisher), Hattah (Apostlebird), Wyperfeld (Blue Bonnet, Regent Parrot, Major Mitchell, White-backed Swallow, White-winged Triller, Splendid Fairy-wren, Pallid Cuckoo, Gilbert's Whistler) and then home, some 4000 kilometres later. 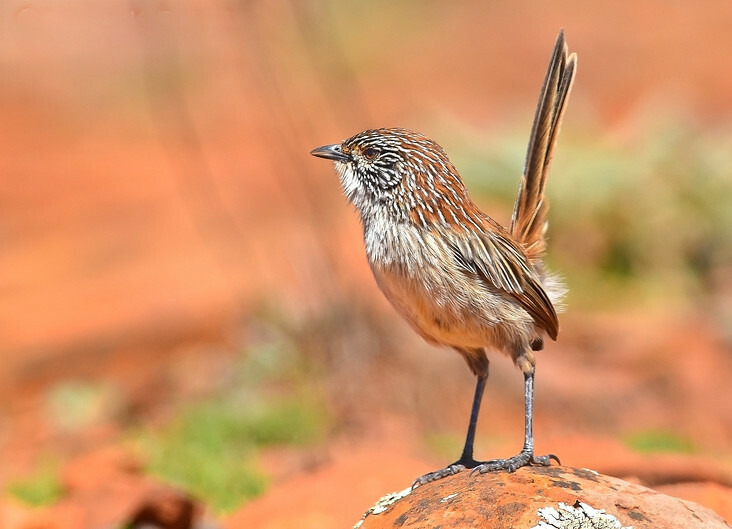 Short-tailed Grasswren. Image Greg Oakley.